Prevent cancer and disease degenerative. Having vitamin B1 and mineral is higher than the white rice. Red rice is the same type of rice as regular white rice, but it has been processed less. Specifically, red rice is rice that hasn't been milled to remove the outer layer of bran on each of the grains as well as the germ, which is basically the seed which causes the rice plant to grow. This outer layer of bran means that red rice takes longer to cook than ordinary rice. Red rice has a slightly nutty flavor and a firmer texture than regular rice. 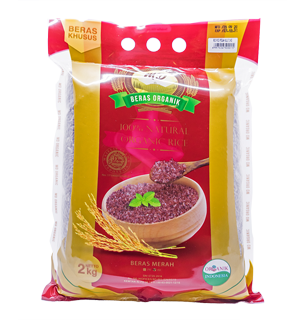 Because the bran provides dietary fiber and essential fatty acids, and the germ contains a number of nutrients, red rice is generally considered healthier than ordinary white rice. Indeed, it is to make up for the relative lack of nutrients that white rice is typically enriched with vitamins B1, B3 and iron. Even so, red rice provides nearly four times the protein as white rice, and there's no way of adding this protein back into the white rice. The fatty acids found in the rice bran can eventually turn rancid and spoil. Thus, red rice has somewhat of a shorter shelf-life than plain white rice.